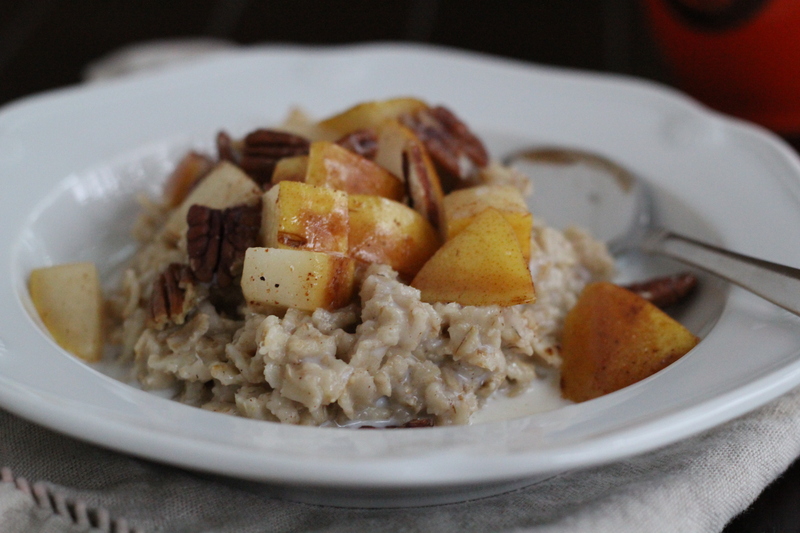 Pear Spice Oatmeal…A Fall Favorite! Oatmeal is a year round breakfast for me, but I especially love it on the cooler days of fall and winter…a perfect comfort food! A different way to work out during pregnancy…The Pregnancy Project DVD. The following is a guest post from Kallah Oakes who is pregnant with her second child. I saw Kallah when she was only a few weeks along, and she told me she was planning on using The Pregnancy Project DVD throughout her second pregnancy. I had not heard of this method, and so asked if she could share with us a little about how the exercise program works and how she is faring (she is almost six months pregnant now). I wished that I had learned about this kind of exercise when I was pregnant as I think a lot of the running that I did was hard on my joints, etc.! I was especially interested in what she says about our mindset during pregnancy in regards to exercise. It’s good to workout but we shouldn’t be “results oriented” while we are allowing a child to grow inside! So true! Should we exercise when we have a cold? Should we workout if we have a cold or a cough…or should we lay low for a while? Well, that depends on what the ailment is. If your symptoms are from the neck up, meaning you have sniffles, a runny nose, headache and perhaps a very mild cough, it’s probably OK to perform a mild workout. The key is to make sure you have no difficulty breathing during or after a workout. Experts agree that going at one third your normal pace might be the best way to proceed and if you feel worse a few hours later – a few days rest are in order. From 5K to Marathon in a Year! At 65, he started running and accomplished a marathon in a year…and so much more! I saw this post on SparkPeople and thought I would repost it here for my 9 Kid Fitness readers…Great story! I have changed my tune over the years when it comes to what I eat after a run or hard workout. It used to be that I really didn’t think about the makeup of an after workout snack or meal…I just ate what I felt like and didn’t worry too much about it. Then I went through an “extreme” phase where I ate only low-fat foods that were also high in energy. Now in my mid-forties,my thinking about post workout foods has evolved and I have a more healthy outlook. Shoulder and arms workout with #4, #5, #6 and #7. All eyes on the dvd playing in the laptop. I’m breaking my electronics pledge already. It does come in handy, however! Thought of the day: Rain, rain, go away…come again another day (like late next week maybe). Peter (#4) diving off the high platform at Lovejoy Pond, Maine. As I write this it’s the end of Day Two of the Hetzel Adventures in Good Clean Fun. I find my eyes half closing at 10:20 p.m. and, considering all that we did today, I’m surprised they don’t simply rebel against me and shut on their own for the night. We just finished playing the second round of Phase 10 and it’s still not a completed game yet. I have figured out, though, that personalities are revealed through card games and you can learn a lot about your children by playing a few games with them! Gotta love those summer fruits!